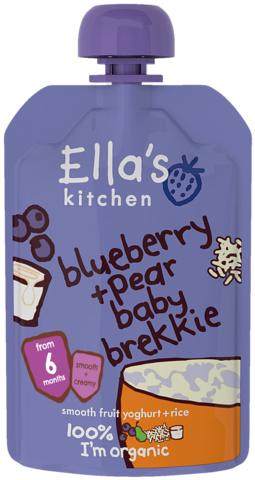 Hello, I'm 100% organic blueberries, pears, yoghurt + rice - with a dash of lemon juice and nothing else added, not even water. I told him everything also has to taste great, and he agreed! Values per 100g : Energy 335kJ/79kcal, Fat 1.0g, of which saturates 0.6g, Carbohydrate 15.2g, of which sugars 8.2g, Fibre 1.8g, Protein 1.5g, Salt 0.25g.